Typical financial investors in Unitus Ventures (formerly Unitus Seed Fund) II, LP (USF II) make direct investments as limited partners to the fund via a series of capital calls over the 10-year life of the fund. 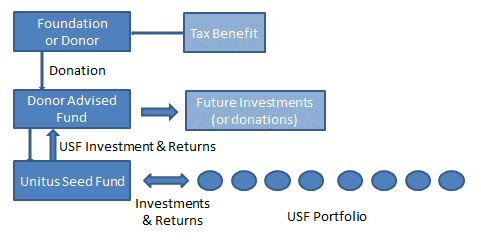 Those investors receive distributions from USF II over time (with amounts and profits based on the performance of the fund) which can be used for whatever purpose the investor wants. This is the normal course of business for Unitus Ventures (formerly Unitus Seed Fund) and the typical investment model for most individual investors. Some investors who are also philanthropic donors have inquired about making direct donations, and/or contributions from family foundations. Since USF II is a for-profit fund, we cannot take donations. There also are a variety of considerations around foundation investments, to be addressed separately. In this note we are addressing two scenarios: investors who already have a Donor Advised Fund (DAF) and those who do not. In either of these cases, the investor is deciding to make their investment from funds they have earmarked for charitable use rather than considering USF II a pure financial investment . They are a donor who is investing with the expectation of seeing more impact from their donor dollars over time. They are looking to grow funds, ultimately re-investing or re-deploying proceeds in other areas and also receiving tax preferences at the time of their donation, all while supporting the social impact of the organizations in USF II’s portfolio. An individual investor in a high tax bracket receive their tax preference on moneys donated to a DAF in the current tax period. A hypothetical $100k DAF/USF II contribution in year 1 results in a potential $35k refund, as well as an asset in their DAF that returns a multiple of the $100k over time, for future impact investing or charitable deployment. This may be a preferred outcome for such an individual vs. investing from their personal impact /donation allocation over the 10 years of the fund and not receiving any tax benefit (beyond the long term capital gains treatment that venture investments qualify for). Of course it also means that such funds (and their appreciated returns) are permanently allocated to impact investing and/or donations. If you already have a DAF at a community foundation (like Seattle Foundation), it’s possible that they will qualify USF II and allow such investments. If you use an institutional DAF service provider (like Fidelity), they also may or may not be willing to help you invest in USF II. For those without a DAF or with an inflexible DAF, USF II has partnered with ImpactAssets (IA) to provide a simple method to establish an account and investing in USF.